Who lives within your tent? Who settles on your holy mountain? One who walks with integrity, and who acts justly, and who speaks truth in their heart. Our High Holy Day theme this year is “truth”. The Days of Awe bring us together in a community of spiritual practice that celebrates truth-seeking. We seek deeper understanding of the truth of our own experience and relationships. We seek to align ourselves with the moral and spiritual truths of our world. We seek courage in community to face the truths of our lives that can lead us toward greater wholeness. The many Jewish names for G-d can be understood as our people’s attempts, bound by the limits of our language and consciousness, to name the shared, ongoing truths of being alive. Seeking and being with truth is how we understand ourselves, each other and our world. The spiritual practice of the Days of Awe is itself an act of resistance — especially in these times. By practicing together, we strengthen our muscles for discerning truth, we grow our capacity to recognize and name what is untrue, and we build our courage to speak truth to power. Unless otherwise noted, services are held at the Oakland Scottish Rite Center (located at 1547 Lakeside Drive, Oakland, CA 94612). Other services are held at Kehilla Community Synagogue (located at 1300 Grand Ave, Piedmont, CA 94610). 10:30 am at Kehilla Community Synagogue. Practice in the power of this one Shabbat between Rosh Hashanah and Yom Kippur – the Shabbat of Turning. Led by Howard Hamburger and Julie Nesnansky. Kiddush sponsored by Amy Bat Tzipora & Beth Weinberger. 6:30 pm at the Scottish Rite Center. Doors open at 6pm. On this holiest night of the Jewish year it’s our custom to wear white, to avoid leather, to fast, and to pray wearing a tallit/prayer shawl – the only time in the year that a tallit is worn at night. This service, beginning with the chanting of Kol Nidre, initiates a practice period that will last for the next 25 hours. Led by Avi Rose, Hazzan Shulamit Wise Fairman, Debbie Fier, Beth Dickinson, and Julie Nesnansky. Sermon by Rabbi Dev Noily. 6:30 pm – 8:00 pm at Kehilla Community Synagogue. Doors open at 6pm. Join Kehilla’s Director of Youth Programs, Rabbi Gray Myrseth, and local treasure and world musician Lior Ben-Hur for this special family experience of Kol Nidre. Enter into the holiness of Yom Kippur with music, story and tradition that brings families into the experience of this holy time together. 6:30pm – 7:30 pm at Kehilla Community Synagogue. Doors open at 6pm. Jen Miriam and Alon Altman bring their warm, loving and puppet-filled world to a musical Kol Nidre experience for little ones up to age 5 and their grown-ups. See our full list of youth services. 9:30 am – 1:30 pm at the Scottish Rite Center. Doors open at 9am. Services open with a meditative soundscape by Debbie Fier, continuing with Rabbi Dev Noily, Sharon Grodin, Hazzan Shulamit Wise Fairman, and Julie Nesnansky. Congregant Sermon by Avi Brooks. 12 – 1:15pm, with Noa Grayevsky. September 19, 3:00 pm – 4:00 pm at Kehilla Community Synagogue. The Fast I Desire – Yom Kippur Direct Action and Direct Service – this one starts at 2pm! Learn more at this link – we will be doing the “direct service” – a walk from Scottish Rite to Kehilla on YK afternoon offering food and water to people living in and around Lake Merritt. All through his life religious thinker and activist, Rabbi Abraham Joshua Heschel, was torn between two radically different spiritual ideals: the Path of Love which emphasized compassion, kindness, and community; and the Path of Truth, which focused on cutting through the lies that obscure human integrity, and struggling to change the social order. Rabbi Burt studied with Heschel for four years in the 1960s, but it was only after his teacher’s death that he discovered Heschel’s unsolved struggle. In this workshop we will examine the two paths in relation to Heschel’s life, and we will discuss why it was that they presented such an enormous problem for Heschel. Social action and practicing self-care from a Jewish perspective in these difficult times can be an act of ‘spiritual resistance.’ This interactive workshop will explore how we are taking care of ourselves, what activism we’re currently engaged in, and suggestions for political engagement opportunities in advance of the mid-term elections. Come join us for a relaxing Qigong practice, which will support us to harmonize our bodies, heart-minds, spirits, and life force. We will combine movement and stillness, in sitting, lying, and standing postures. The emphasis is on connecting internally, so anyone wanting to attend is welcome to adapt any movements to fit their own needs. Some props will be provided, but you are also welcome to bring your own. September 19, 2:00 pm – 8:00 pm at Kehilla Community Synagogue. 2:00 – 4:30 pm Drop off break-fast pot-luck offerings at the Kehilla kitchen (or bring them at 7:45) – please bring salads & desserts to share! The main meal will be sponsored by Emily Newfield and Rachael Reiley, in loving memory of Anne Guttman, grandmother of Emily and Rachael and great-grandmother to Riley Newfield, who loved people and food and feeding people with all her heart, and is missed by her family every day. Led by Sharon Grodin, Hazzan Shulamit, and Kehilla’s Musical Prayer leaders: Debbie Fier, Julie Nesnansky and Beth Dickinson. With Rabbi Elliot Kukla, Hazzan Shulamit, Debbie Fier, and Julie Nesnansky. With Howard Hamburger, Rabbi Dev, Hazzan Shulamit, and Kehilla’s Musical Prayer Leaders: Debbie Fier, Avi Rose, Julie Nesnansky and Beth Dickinson. Drop off break-fast pot-luck offerings at the Kehilla kitchen (or bring them at 7:45) – please bring salads & desserts to share! The main meal will be sponsored by Emily Newfield and Rachael Reiley, in loving memory of Anne Guttman, grandmother of Emily and Rachael and great-grandmother to Riley Newfield, who loved people and food and feeding people with all her heart, and is missed by her family every day. Join Kehilla, the Islamic Cultural Center, and Montclair Presbyterian for a special evening of shared food and connection, as well as conversation and teachings on supporting the Sanctuary movement and immigrants from all three traditions. KEHILLA FOLKS: Bring a main vegetarian dish to serve at least 6 people in addition to your party. Join us for a special Shabbat service while our joy is amplified by the celebration of Sukkot and the welcoming of Rabbi Elliot Kukla and Abby Weintraub’s new baby. We’ll sing Hallel, extra songs of praise, joy, and longing, and make hakafot, circular processions with lulavim– if you have one, bring it along to shake! Please bring a veggie dish to share for a festive kiddush in the Sukkah after services. Gather at 7:50 a.m., short teaching at 7:55 a.m., silent sit from 8:00 – 8:30, mourner’s kaddish and announcements at 8:30. Please enter through the patio off Fairview Avenue. Kehilla, Chochmat HaLev, Aquarian Minyan and Beyt Tikkun come together at Kehilla to end and begin the Torah and to dance, dance, dance with our community-enhanced Klezmer band led by Mike Perlmutter! We invite you and your children to participate in as many of these opportunities as possible. See the full list of Kehilla’s Youth High Holy Days Services. Buy tickets for youth programming here. It takes a community to make High Holy Day Family Services happen! Sign up to help at either Rosh Hashanah or Kol Nidre. For more information about volunteering, email natalie@kehillasynagogue.org. Parents: We are aiming to find some supportive hands to help us make the Family Services on Rosh Hashanah and Kol Nidre the amazing, uplifting, smooth running services we know they can be. Do note that volunteering to help at either/both services will contribute to your Avodah (service) hours! Sign up to volunteer for High Holy Days family services. Teens: We are looking for some fantastic teen assistance with our Rosh Hashanah Morning and Kol Nidre Family Services! Come process with the Torah and participate in our interactive service! No preparation required, but sign up for the service(s) you are interested in helping with so we know you’re coming! B’nei Mitzvah program graduates (and soon-to-be graduates!) have always had a great presence at this service, and the more teens there, the better! Rosh Hashanah Morning: Scottish Rite Center on September 10, at 9:50am (service starts at 10:00am and goes until about 11:15am). Stories, music and lots of participation fill this fun, kid-centered experience that includes Shofar sounding, Torah procession and other Rosh Hashanah traditions. If you have any questions about the Rosh Hashanah family service, feel free to contact Beth Dickinson at bdickinson12@gmail.com. High Holy Days can’t happen without the help of our many dedicated volunteers. Volunteering at High Holy Days counts toward your Avodah hours. Register to volunteer. For more information on volunteering, contact maya@kehillasynagogue.org. Glitter Kehilla invites Jews in their 20s and 30s of all genders and sexualities to come together for High Holidays with the Kehilla community. Tickets for Glitter Kehilla are sliding scale — a meaningful contribution as you’re able is appreciated, but no one is turned away for lack of funds. We’ll be sitting together at the Scottish Rite Center in the balcony to the right. We’ll have the space marked with signs. Join us for Glitter Tashlich on Monday, September 10th at 6:00pm. We’ll be meeting at 17th St. and Lakeside Drive on the grassy knoll. Please bring a vegetarian dish to share! For more information, join our mailing list by emailing glitterkehilla@gmail.com or joining our Facebook group at facebook.com/groups/glitterkehilla. Glitter Kehilla is building a radical Jewish community of people in our 20s and 30s (ish). We center queer leadership, and our community is all genders and orientations. We create meaningful Jewish rituals, celebrate holidays, learn together. We’re fabulous: join us! See below for information about reserved parking for disabled participants. There are limited number of reservable parking spaces available in the rear parking lot of the Scottish Rite Center for drivers with disability parking placards and with the greatest need. Parking reservations for disabled community members can be requested by clicking here. If a drop off is planned: one of our wonderful volunteers can meet you at the curb in front of the building and provide assistance getting inside, as long as you are dropped off by 15 minutes before the start of services at the latest. As always, carpooling is strongly encouraged, and in any case please allow plenty of time to arrive and find seats. Accessible seating options will be available on a first-come basis. The amount of reserved-area seating will be based on our experience of the community’s needs. If you have particular needs for seating accommodation please contact Dee at Dee@kehillasynagogue.org. At services, volunteers will help you find a spot in the appropriate designated area when you arrive at services. Arriving early will mean greater choice for you and will help us make suitable arrangements for everyone. Later in the service, empty seats will be released to others who may no require any accommodation. Arriving scent-free will increase the availability of seating choices for everyone. As in previous years, the left half of the main floor, the loge, and the first quarter of the balcony (on the left closest to the bima) will be designated as scent-free seating. For more information about accessibility for High Holy Days, email Dee@kehillasynagogue.org or call 510-547-2424 x100. There are a number of ways to prepare for High Holy Days music participation. 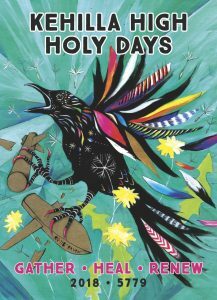 In preparation for High Holy Days, you can enjoy listening, learning, and singing along with these beloved High Holy Day melodies here. Read Hebrew, transliterations, and translations of the liturgy. On Simchat Torah, our dancing with the Torah will be to the beats of our awesome community klezmer band! Mike Perlmutter, Dave Rosenfeld, and local klezmer great Joshua Horowitz will be offering a series of klezmer workshops where they’ll pass on this amazing traditional music and will prep us to be part of a community-infused celebration band for Simchat Torah. All workshops will be held on Monday nights from 7 – 9pm at Kehilla, please come to all the workshops if you can. You need to come to AT LEAST TWO workshops if you want to play with the band on Simchat Torah. Cost of the workshops is $20 – $30 per session, sliding scale. Please pay on the high end if you can; if you need financial assistance email Rabbi Dev. Buy tickets for this year’s High Holy Days services.